Fuel Consumption: 2.0R N/A vs "The GT's"
my driving is mostly highway now. i get about 500kms per tank if i'm not booting it. do u guys have mod ECUs or something in your dash...? I Swear to God officer my Cruise Control was Stuck!! Doesn't yours have the trip computer in the dash. It can display current, average consumption, or distance to empty. Subaru SATNAV.....They are the bomb! Tells you everything plus even gives you a calculator...random! So what is yours showing? The litres per 100 km displays should be to one decimal place. Re: Fuel Consumption: 2.0R N/A vs "The GT's"
Im very happy wth my fuel consumption as i average 9.0 per 100kms in stop start conditions. i dont think i have ever seen it go higher then 9.5.
i drove from Melb to Syd on just under 70L. and i get around 450km-500km in suburbs. not bad at all! 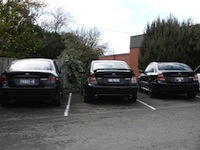 I now get about 14-15l/100km (mainly stop start peak hour - some motorway on weekends - not driving too hard). i got the 2.5 NA and i get really good fuel consumption O_o, i get around 8.6-9.0L per 100k, and i usually get 600ks out of the tank, but if im driving bit harder around the hills around 550ks? i also have a mixture of highway driving AND town driving since i live 40mins from town so i spend 10-15mins on highway but there still starts and stops at the lights ect. If you put the 'current fuel consumption' display up, it seems to use shitloads of fuel under 30kmh, no matter how much throttle you use or what gear youre in. Fuel consumption is a pretty consistent 6.5 to 8.5 from 50 to 110kmh, and rising to 11 or 12 on hills.